Werner Pfeiffer’s first day of school ended abruptly when everyone was whisked into an air-raid shelter as the school, located in the industrial city of Stuttgart, Germany, was leveled by Allied bombs. Pfeiffer’s vivid experiences as a child growing up during the Second World War heavily influenced his subsequent career in art. During the war, there was a severe paper shortage. Books and publications were censored, first by the Reich and then by occupying Allied forces after Europe’s liberation. Since then, the versatile artist has produced an extraordinary body work which dramatically rearranges our understanding of the nature of both paper and the book. Like much of the DADA art which inspired it, Pfeiffer’s art, often whimsical and playful, nevertheless remains capable of delivering profoundly resonant social commentary. Addressing censorship, Pfeiffer created a series of sculptures which repurpose actual books, turning the medium into the message. The books are whitewashed (literally), sealed shut, and suspended from ropes evocative of nooses. Though emerging out of the censorship Pfeiffer encountered during the war, the January 7 Charlie Hebdo attacks and subsequent Je Suis Charlie rallies shows the enduring relevance of dialogue concerning free speech and self/censorship. As information becomes increasingly digitalized, Pfeiffer responds by celebrating the physicality of the book, producing inventive, origami-like art books which re-imagine how a book might be structured. These books invite viewer participation and become interactive sculptures which can be folded, deconstructed, re-assembled, manipulated, and read in a myriad of different ways. Pfeiffer even designed the playful brochure for the exhibition, a “flexagon” able to be folded and re-shaped (incidentally, deciphering how to open and manipulate the brochure occupied your humble author for the better part of an hour). The exhibition’s centerpiece is Out of the Sky, Pfeiffer’s thoughtful and evocative memorial to the victims of September 11th, which the artist himself witnessed firsthand. 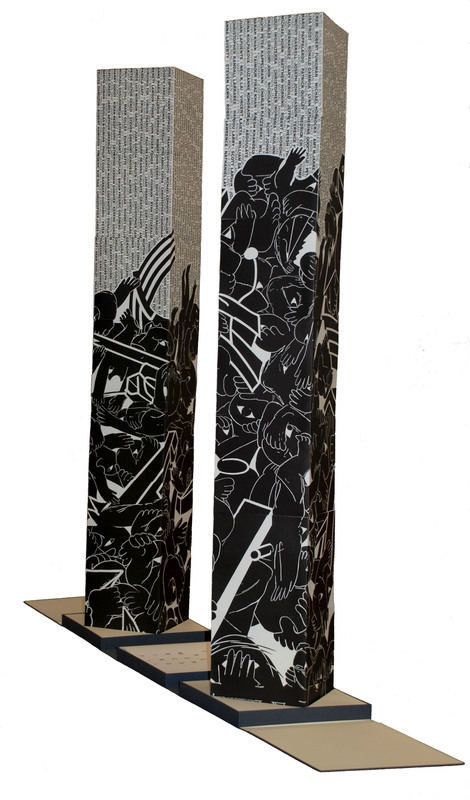 It’s a book that can be opened up and assembled to re-create the Twin Towers, inscribed with the names of the victims, each tower also enveloped by two sizeable woodcuts depicting a churning mass of crumbling bodies and architecture. Whenever it’s put away, the towers must be physically disassembled from the top down, recreating the towers’ collapse. “Books externalize our brains,” wrote the reliably witty John Updike in his New York Times editorial “A Case for Books,” in which he argued for the relevance of the book in a digital age. Indeed, Pfeiffer’s many reinventions of the book bespeak of an especially agile, Mozart-like mind. But Pfeiffer remains ambivalent about the digital world (the exhibition catalogue itself is digital, and certainly worth exploring). But the computer has indeed triggered a paradigm shift with how we access information, and meaningful conversation seems ever-obscured by the deafening roar of internet white-noise. As for whether the information age has really benefited humanity, future generations will likely be in a better position to judge than we.